I read Alice in Wonderland when I was an adult, long after seeing the Disney animated version (though it was first released in 1951, I saw it years later). I don’t know that much about Lewis Caroll, admittedly, but I do know Alice works as a dream, as a fantasy, a stream of consciousness. It’s crazy as a Mad Hatter, and as mysteriousas a hookah-smoking caterpillar. Before the new movie comes out, I highly recommend you read Carroll’s version of Alice, and some of his other writing. Judge for yourself whether or not a dream-like, nutty as a fruitcake story still holds up after all this time, and under Tim Burton’s masterful visionary film making (well, my opinion anyway). Previous Traveling lightly…a little heavily. Shucks. It’s not out until March, 2010. They put the trailer up and then Disney took it down, but I caught it on MSN. It looks very Tim Burton-ish, of course his own spin on it should be fun (he can never go wrong with me). But you are right. It’s been a long time since I read the book, and a reread might be in order. Got some time, though. 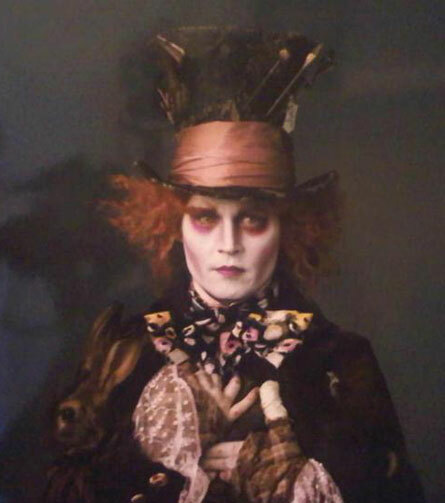 Johnny Depp as the Mad Hatter. Perfection.